BLENDED/ONLINE CLASSES: We are pleased to offer our new American Safety and Health Institute & American Heart Association Blended CPR/ First-Aid Courses. 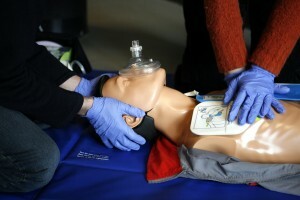 The majority of companies today require some or all of their employees to be CPR and/or First-Aid certified. This training is usually offered onsite at the place of employment taking over four hours of valuable work time: a very costly employer expense. The online lecture portion of the courses can be purchased on our EZPAYPAL page and then completed at anytime and at the students own pace. For certification purposes, the online course must be followed by a scheduled hands on skills check-off conducted by one of our professional certified CPR/First-Aid instructors saving the employers and students hours of classroom instruction. These skills sessions are often much more personalized and if you are an individual getting your own personal training your hands on training may likely be a one on one training which many people prefer. For more information or to set up a blended course, please contact us, 623.398.5811, and we will send you the information you need to get started. If you have already taken and completed the first portion of the American Heart Association blended course and are needing to just do your hands on skills session, please call us, 623.398.5811, and we can schedule your time.